Lock Lane head coach Paul Couch was proud of the efforts of his team as they gave Batley Bulldogs a good game before the Betfred Championship side ran away with their fourth round Coral Challenge Cup tie. 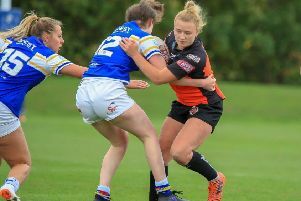 Although the Castleford-based National Conference side eventually lost 62-6 they initially went toe to toe with the Bulldogs and could count themselves unlucky to be 24-6 behind at half-time. Batley opened the scoring with tries by Danny Yates and Tyler Dickinson that were converted by David Scott. A flowing move was finished by Wayne Reittie and Scott’s third goal made it 18-0, but Lane hit back with Steven Scott’s great offload leading to a Connor Land try . Batley scored again, however, with Michael Ward storming over and any hopes of a comeback in the second half were ended when Reittie went over for his second try and Louis Jouffret goaled. As Lane tired the Bulldogs went on to run in six more tries through Jouffret (two), Sam Smeaton (two), Tom Hemingway and Reittie. After the game Couch said: “Of course I’m disappointed with the scoreline, but I am very proud of all our lads. What an effort. "With 20 minutes left we had no subs left and no bodies to put on. In the first half we completed 13 out of 15 sets, but in the second half we just didn’t complete. “I’m really pleased we got to this round and happy with what we’ve achieved so far this year, but we haven’t finished, we’ve got to move on from this.